Perfect for office and industrial use! Place these vinyl shop ticket holders on any metal surface and keep equipment manuals or other large documents at your fingertips. Provide maximum protection for documents stored in rough, industrial environments, this Document Storage Pouch with Magnetic Backing is perfect for office and industrial use. Place these vinyl shop ticket holders on any metal surface and keep equipment manuals or other large documents at your fingertips. 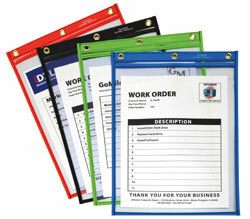 Magnetic backing allows the storage pouch to attach to machinery, file cabinets, racks and more. The vinyl pocket features a thick piece of rigid vinyl at the top to ensure the pouch can withstand the weight of large documents. Size: 8-1/2 x 11. Clear vinyl pocket with white backing on the front and magnetic backing on the back.